Lady Late model Racer from the Grove mid 70's? 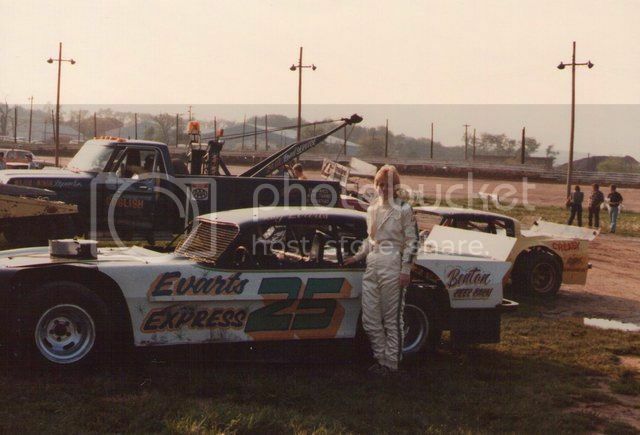 I found this picture from the Grove in the Mid 70's of a Lady Late Model Racer. It looks like it says "Jen" on the Helmet. Since I'm not a Late Model guy can anyone fill me in on who she is and what year it was? Thanks. Re: Lady Late model Racer from the Grove mid 70's? i want to say Jan Evarts(sp). have some pic similar to this somewhere just have to find them to be sure. nope she's not the one i was thinking of. here's a pic that i think is jan or jen everts with her husband roy's car. pretty sure i remember the one with goodling was a publicity stunt. can't remember what her "claim to fame" was have some contacts that may know. She was brought in by Jack Gunn as a publicity stunt..
Wow, that jarred the memory bank. I remember that. All I could remember was Joy. 1080 wrote: She was brought in by Jack Gunn as a publicity stunt.. THANKS 1080! As always your a wealth of information. My one hobby outside of racing is collecting old, bad movies from the '50s, '60s and '70s. Joy was Peggy in the 1970 B movie Bigfoot and she played Estelle in the low budget picture Run Angel Run. I just found a web site for Joy. Here is info off of her web page. Her page included an email address so she apparently is still living. I see her involvement with Anthony Cardoza a name that brings a smile to anyone that collects bad movies and I mean really bad movies. Joy Wilkerson was named as one of the "Two Thousand Women of Achievement-1971". She was one of the few women to start in the racing businesses. Her show biz career started from 1962 , with five Danny Thomas Specials on Television, She was the entertainer for many charities, such as: Blind Children's Foundation, Multiple Sclerosis, March of Dimes, and mainly the U.S.O. She was awarded the title of : Miss South Vietnam given by all the U.S.A. Military Services, for USO work and after trip to Vietnam with Dale Robertson in 1967. Over the course of her career, she has received numerous awards and recognition's for her charitable work given by various branches of military services, and certificate of achievement from many other charities. Wilkerson also appeared on hundreds of TV. and radio talk shows around the world. She also co-starred in : "Bigfoot" with John Carradine and Lindsay Crosby. Her other film credits are: "Run Angel Run" (girlfriend to William Smith). She's also a lecturer, broadcaster and TV hostess of "The Joy Wilkerson Show" written, produced and directed by motion picture film-maker, Anthony Cardoza. The energetic Ms. Wilkerson dabbled in a variety of sports, including auto racing, in which the famous racing promoter J.C. Agajanian gave her her first try in an all women stock car race at Ascot Park Speedway, in Gardena, California. Prior to her fender banging experience, she was a trophy girl at that track and fell in love with the speeding sprint and midget race cars on the half mile clay oval, where she presented the winning hardware to famous speedsters wearing her shocking pink micro-mini dresses. Wilkerson also raced against astronaut legend Pete Conrad in a Toyota-match race at Watkins Glen..New York. She also competed in ABC-TV's "Wide World Of Sports" Demolition Derby against Cha'Cha' Muldowney, the drag racing queen and Ricky Nelson, Parnelli Jones, Lyle Waggoner, and a host of other Indianapolis drivers. Some of the cars she drove were TQ midgets, full sized midgets, sprint cars, dune buggies, SCCA-Formula Fords at Willow Springs, Stock Cars at 605 Speedway. She drove at Flemington Speedway (N.J.) and paced the NASCAR hotshoes Richard Petty, David Pearson, Cale Yarborough, Neil Bonnet and Bobby Allison at Ontario Motor Speedway, in a Datsun 280-Z for the Winston-500 mile stock car race. She also drove Gary Bettenhausen's sprint car in Terre Haute, Indiana. Not claiming to be a champion race driver, she did it to help the future racing-ladies get publicity and notoriety in motor racing like newcomers Sarah Fisher and Shawna Robinson, etc. In one case. She met lady astronaut/Indy 500 racer Janet Guthrie at a car show in Los Angeles and gave her some pointers on how to get PR for herself. The Indy 500 competitor went on to make a name for herself at Indianapolis and put herself into the racing history books. Joy Wilkerson's other attributes besides auto racing, are acting, traveling, ballroom dancing, swimming, horseback riding, jogging, skipping rope, flying, public relations, skating and driving FAST CARS. Danny Thomas started Wilkerson's career in showbiz and Bob Hope sent her to her first trophy-girl presentation to the Riverside International Raceway (California) which unknowingly connected her with the auto racing challenges. Born in Detroit (a Leo), she fits right into the limelight of Hollywood kleiglights that brightens her world, showing who she really is. JOY WILKERSON. Last entry - Joy Wilkerson passed away several years ago in San Diego. Due to her work with the USO in Vietnam and her loyal support of the Marine Corps League, Joy received a military burial in a national cemetery in San Diego. Have to say she lived a very full life!